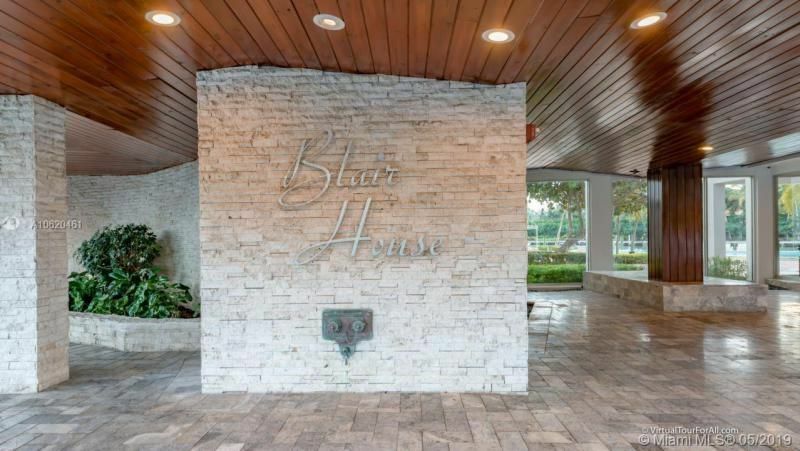 Beautiful unit at The Blair House in Bay Harbor Islands. Updated 1820 sf apartment with two bedroom and 2 and a half bathrooms. Incredible views of Biscayne Bay, Miami Beach Skyline and Indian Creek golf course from every room. Natural light all day. Minutes away from the beach and Bal Harbour Shops. A rated K8 Public School two blocks away. Concrete walls, porcelain floors, new kitchen and stainless steel appliances. Washer and dryer inside the unit. Building was completely remodeled, outside paint, new hallways, new Ac equipment. Unit has a private storage on the same floor and a bicycle and kayak storage. HOA includes AC and hot water. Recent special assessment fully paid. MIAMI Association of REALTORS® is not responsible for the accuracy of the information listed above. The data relating to real estate for sale on this website comes in part from the Internet Data Exchange Program and the South East Florida Regional MLS and is provided here for consumers' personal, non-commercial use. It may not be used for any purpose other than to identify prospective properties consumers may be interested in purchasing. Real estate listings held by brokerage firms other than the office owning this website are marked with the IDX logo and detailed information about them includes the name of the listing brokers. Data provided is deemed reliable but not guaranteed. Copyright MIAMI Association of REALTORS®, MLS All rights reserved. This property is courtesy of Miami Beach Real Estate Group.